Credit: NASA/Penn State/L.Townsley et al. This series of Chandra images shows a mosaic of the Rosette Nebula region. The colors represent various levels of X-ray energy: red shows low-energy (0.5-2 keV) and blue shows high-energy (2-8 keV) X-rays. The mosaic is formed from four Chandra images, starting with the OB association - a group of hot young stars - at the center of the Rosette Nebula on the right and stepping southeast (left) into the Rosette Molecular Cloud. 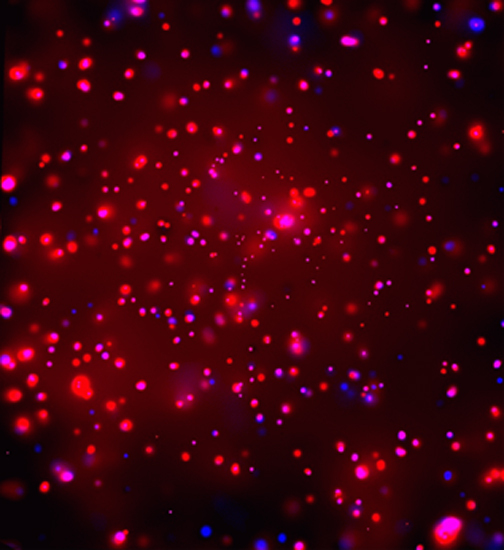 The red sources in the Chandra images are dominated by low-energy X-rays and suffer little absorption by the molecular cloud, whereas the blue sources are very young stars still embedded in the gas and dust from which they formed. The diffuse emission visible in the panel on the upper right is due to hot gas produced by the collision of stellar winds from the most massive stars in the nebula. Credit NASA/Penn State/L.Townsley et al. Scale Image is 17 arcmin across. Coordinates (J2000) RA 06h 31m 52.00s | Dec +04° 55' 57.00"